Take the helm of your future! Photo courtesy of Danielle Durak. The college rep visits for November feature the schools of Joliet Junior College, Northern Michigan University, and the University of Illinois at Springfield. The Joliet Junior college visit takes place on November 6th from 9:20 to 10:15 a.m, Northern Michigan on November 16th from 11:20 to 12:15 a.m, University of Illinois on November 19th from 10:20 to 11:15 a.m and Cortiva Institute in Joliet from 12:20 to 1:15 p.m.
All visits involve having a college rep come to the library who explains and answers questions about the desired school for that day. 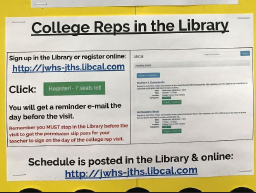 To register for these visits, students must go online to the Joliet West library and then from there click on college/career prep and then click on college visits which will direct them to all the events coming up later in the month. In order to participate in a visit, students must stop in the library for a pass that the teacher for the period must sign to excuse them for that class. It is crucial that students make sure to get those last few visits in before it is time to decide on where to go for good so make sure to get in all the last times to visit before it is too late!